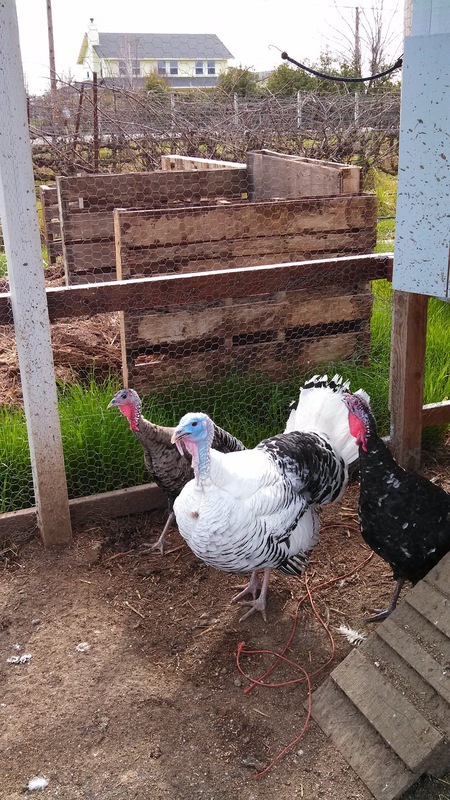 I think we casually mentioned our turkeys a couple of times on the blog, but there are actually a lot of turkey stories to tell. Since I don't want to draw out the "turkey tales," I'll give you the rundown in one big post. When we got the turkeys back in June, JP had grand plans of raising them, "processing" them himself, and then selling them to friends and family for Thanksgiving dinner. He got a couple guys together, set up all his gear (it was actually a well-thought out process - another project that he studied and learned about via books and youtube), and together they "processed" 8 or 9 turkeys. The term "processed" is just a fancy way of telling you that those turkeys met their maker that day. A few turkeys into the process the guys realized that the birds were too small to accommodate anyone's Thanksgiving feast, so JP decided to pardon the rest and give them a few months to gain weight. They became "Easter Turkeys" that day. 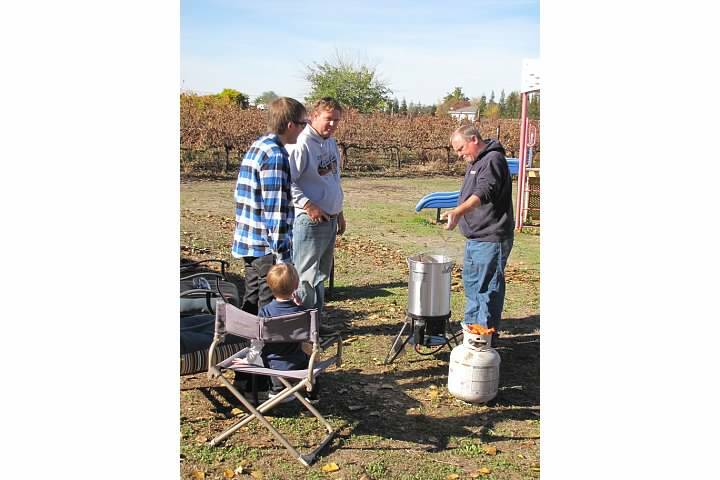 Here's a picture of JP, his dad and his brother deep frying one of his turkeys on Thanksgiving. We all got a good laugh about the anorexic turkey. It's a Saturday in December. Both JP and I have to work, so my parents stayed in town an extra day to watch the kiddos. I am sitting in the family room with my parents and LJ, enjoying the last few moments before heading into town. I look out onto the back deck and lo and behold, a giant turkey is sitting on one of the rails. It took a few moments to register what I was seeing. My parents had told us a few days prior about a pheasant they had seen in the back yard, so that was my initial thought. When I realized it was a turkey I assumed that somehow the coop had blown open and that I was about to find turkeys all over the front yard. I went to the front window to confirm my suspicions. What I found was not at all what I expected. Two dogs were in the turkey side of the coop. My brain quickly tried to fill in the gaps. Then I saw one dog with a turkey in his mouth. My eyes immediately went to the rest of coop. Feathers. Everywhere. Mouth agape I threw open the door and yelled at them to stop. (Like that was going to work.) I hollered for JP who was in the bedroom about to get in the shower. He went outside, chased the dogs out of the coop, and I watched his shoulders slump and his head shake from side to side as he surveyed the site of the massacare. I watched him calmly walk across the lawn, wheel the garbage can back to the coop and start depositing dead turkeys into it. I felt so bad watching him clean up the mess; products of much thought and dedication. I wondered what he was thinking. I had to leave for work before he did, but over the next hour he would have to euthanize one more turkey and figure out how to get the ones who had escaped the attack back into the coop. He didn't have time to do everything, so the escapees were left to roam the vineyard for several hours. Our neighbors, the dog owners, felt terrible about what happened. They were so sweet and actually paid us for the turkeys that were killed. Something we told them they absolutely DID NOT need to do, but they insisted. I actually felt bad about how bad THEY felt. Like JP said over and over again, "they're just turkeys." These neighbors have helped us out several times since we moved out here and we like them a lot, so I hated that they felt so bad. The dogs just happened to come onto our property, found a weak spot in the coop's wire fencing and decided to do "go hunting." This couple went above and beyond. We're lucky to have such wonderful neighbors. The ones who managed to go the distance. All in all, we were left with 5 turkeys. JP was able to round up one of the runaways (using a net, which was quite comical - even under the circumstances) and another neighbor (who had heard about the incident from the dog owners) realized that he had one on his porch and brought it back to us in his truck. Since December, two more turkeys died and one was given to JP's co-worker. The final two are still hanging around, but JP wants to take them to the poultry auction or sell them online sometime soon so he can expand his chicken operation. It's not good to be a turkey on the "P Family Farm."